There was a time when a heavily weathered collector car or truck was considered a bit of an eyesore. In fact, if you brought one of these vehicles to a car show more than likely you would receive grief for showing a car with faded paint and surface rust. But not anymore. The era of patina on vehicles has been fully embraced, and rightfully so. Currently the genre is ripe with creation. 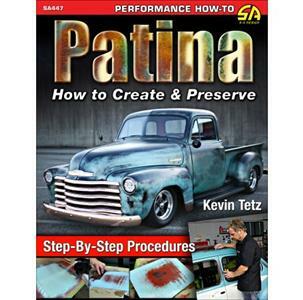 Kevin Tetz of Paintucation(R) has delivered the first book ever on the many variables involved with patina. In step-by-step format, Kevin walks you through creating patina from existing paint, preserving *already there* patina, and painting patina (steel, plastic, glass). Each process is unique and requires its own set of skills, procedures, and tools. With tens of millions of potential projects to consider, finding the right car or truck to patina shouldn't be a problem. And now with Patina: How to Create & Preserve you will have the perfect book to guide you through the patina process.